Prince John of the United Kingdom was the fifth son and youngest of the six children born to King George V and his wife, Queen Mary. Prince John of the United Kingdom (John Charles Francis; 12 July 1905 – 18 January 1919) was the fifth son and youngest of the six children born to King George V and his wife, Queen Mary. At the time of John’s birth, his father was the Prince of Wales and heir apparent to the reigning monarch of the United Kingdom, Edward VII. In 1910, George succeeded to the throne upon Edward’s death and John became the fifth in line of succession. In 1909, John was discovered to have epilepsy and was also believed to have some form of intellectual disability and possibly autism. As his condition deteriorated, he was sent to live at Sandringham House and was kept away from the public eye. There, he was cared for by his governess, “Lala” Bill, and befriended local children whom his mother had gathered to be his playmates. Prince John died at Sandringham in 1919, following a severe seizure, and was buried at nearby St Mary Magdalene Church. His illness was released to the wider public only after his death. The heartbreaking story of the prince that history forgot. Set against a backdrop of unprecedented upheaval in Britain, triple Emmy Award-winning The Lost Prince tells the very human story of a unique family and an extraordinary boy. Acclaimed writer and director Stephen Poliakoff tells the little-known story of Prince John, youngest child of George V and Queen Mary, whose short life spanned one of the most momentous periods in history – the political build-up to the First World War and the machinations of European royalty in the early part of the 20th century. His short life encapsulated such a fascinating period of history. Diagnosed as an epileptic, and suffering from autistic-like learning difficulties, Prince John is unable to participate in public life and becomes increasingly isolated from his family. Miranda Richardson portrays Queen Mary, the emotionally repressed mother of Prince John. A fundamentally inhibited character, she is a loving mother but has great difficulty communicating with her son. Michael Gambon plays Edward VII, Prince John’s grandfather. He is a bluff, plain-speaking cove, with an unmistakable affection for the grandson who often blurts out home truths others are too genteel to articulate. Tom Hollander takes the role of King George V, the deeply conflicted soul who is John’s father. 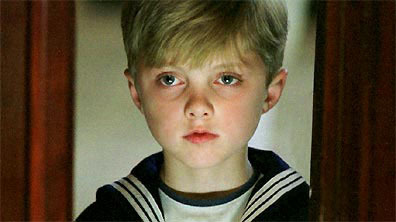 Fourteen-year-old Matthew Thomas plays Prince John from the ages of nine to 14. He beat 600 boys to the part of the royal son. Daniel Williams plays Prince John in the early years.